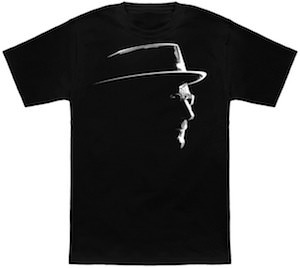 Now you can have this cool Heisenberg T-Shirt. Breaking Bad fans that don’t want to forget about Walter White can now keep looking at him as Heisenberg because he is printed on this t-shirt. 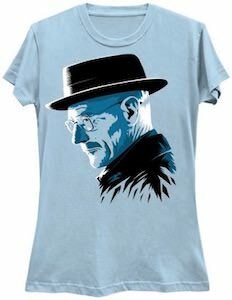 On the shirt you can see a nice side profile of Heisenberg wearing his famous hat and he has that look in his face that means something is going to happen. You can get this Breaking Bad t-shirt in styles for both men and women and they are all made from 100% cotton and are available in sizes Small – 6XL. Now wearing this t-shirt will prevent people from forgetting about Breaking Bad. If you are in a lot of stress then this Breaking Bad stress ball is what you need. The stress ball is not really a ball it is shaped like a head with a beard and glasses and yes it is Walter White or if you prefer Heisenberg. Now when things are nog going as you like then just squeeze head of Heisenberg and I am sure that you feel so much better squeezing a drug lord like him. 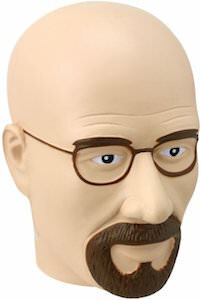 The stress toy is about 11 x 9 cm and is an officially licensed Breaking Bad product. Use it to give it a squeeze or just as a feature on a shelve or your desk. Heisenberg is the drug lord feared by many but one that is actually the ex school teacher Walter White. But you can now own your own little version of Heisenberg. This Breaking Bad figurine shows Walter all dress up with dark glasses and his famous hat and he is holding some of his famous blue meth and a gun so watch out. This Heisenberg figurine is made by Funko in their Pop! Vinyl series and like all the others Heisenberg is 3 3/4 inch tall and he will be delivered in a cool display box that you can use to keep him in new condition. Of course making Heisenberg sell his drugs to all your other friendly figurines may not be a smart thing lets just hope that your other figurine’s are smart enough to stay away from drugs. 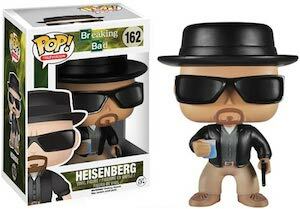 Bring Breaking Bad to your home with this Breaking Bad Heisenberg Pop! Vinyl Figurine. Did you always wonder how it would feel to be a drug lord? 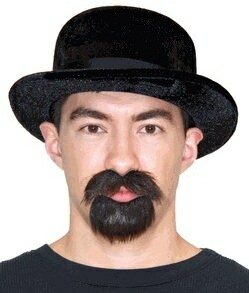 Wonder now more because now you can become Heisenberg from the TV series Breaking Bad. This is a face mask that makes you look like Walter White complete with black hat and glasses. If you Halloween costume makes you become Walter White then you just can’t live without this party mask. The card mask will fit most heads without any problem and that means that anyone can become a meth cook. Lets get ready to become a drug lord by simply wearing this Breaking Bad Heisenberg Mask. This black t-shirt show a silhouette of Walter White from the hit TV Series Breaking Bad. We all know who the true danger is and Walter does to and that is why this t-shirt shows the danger. A t-shirt like this with all the details is just an amazing item to wear if you are really into Breaking Bad. And this Walter White t-shirt comes in a wide range of styles for men and women and yes many sizes to to make it fit your body perfectly. Now you can wear the Danger, Walter White and Heisenberg on your chest all day long by simply getting this Breaking Bad The Danger T-Shirt. From the awesome television series Breaking bad the main character Walter White turns bad and uses another identity as Heisenberg. The image on this coaster is Walter White as his alias Heisenberg with all the details that make him look bad, find his sunglasses and fancy hat as well as the text “Heisenberg” all done as a sketch drawing. 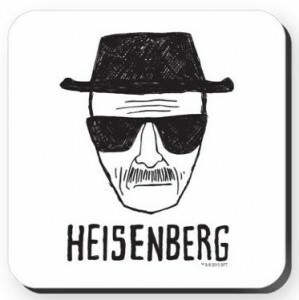 The Heisenberg coasters are made to be very durable with a cork backing to prevent scratching your table, each coaster measures 3.75″ square with a high gloss top finish to protect your image. We all know Heisenberg and the way he changes the drug trade but do you know Heisenbert? I guess Heisenbert is the Breaking Bad drug dealer from Sesame Street. Heisenbert looks like Heisenberg but then with the face of Bert. This fun t-shirt comes in a wide range of sizes and in a men, women’s and youth fit. 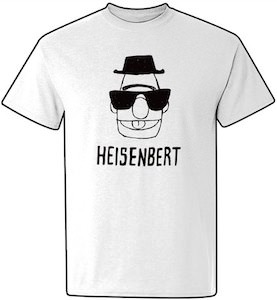 You know the Heisenbert t-shirt even comes in different colors but not in meth blue. So if having fun with Sesame Street and Breaking Bad is something you would like then you just have to wear this t-shirt. 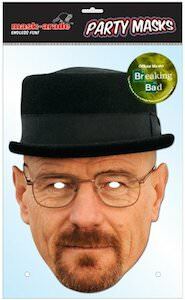 If you have the glasses and want to look a bit more like Walter White then we have the items you need. This set includes Walter’s black hat and a fake beard and mustache. Now you can look like Heisenberg all day long and I am sure that Breaking Bad fans will recognize you while you walk down the street wearing you Walter White face props. Now Halloween and dress up parties are fun again because you can be the bad guy. Lets get ready to dress like Walter and the first thing you need is this Breaking Bad Walter White Hat, Beard And Mustache Set. Now you can have your own Breaking Bad wallet. 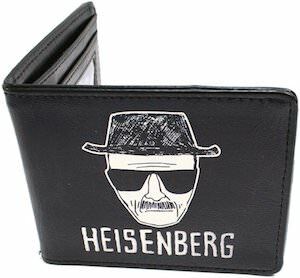 This is a leather bi-fold wallet with on the outside a picture of Walter’s face and the name “Heisenberg”. The picture is printed on both sides of the wallet. The Breaking Bad wallet has has plenty of room for you cards and cash. Of course you can’t store all of Walter White’s money in there but you daily needs will fit nicely in this wallet. A black leather wallet is something nice to have and now it is better as it has Heisenberg on it. Breaking Bad fans come and have a closer look at this Breaking Bad Heisenberg Wallet. Breaking Bad fans will love this mug. 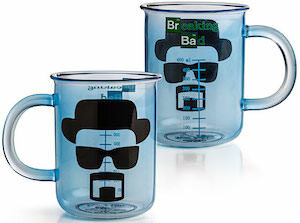 It’s a glass mug that looks like a lab beaker that Walter could use to make his famous meth. And on this mug you can find the face of Heisenberg on one side and the Breaking Bad logo and measurements on the other. A cup like this is ideal for drinking your morning coffee because people will stay away when they see Walter White’s face on that mug so you can peacefully enjoy your drink. So if you are a Breaking Bad fan in need of some fun drink ware then you have to check out this Breaking Bad Heisenberg Beaker Mug.